Strategy formation may be one of the most important aspects of managing a company. Without a proper strategy the ship bounces around the sea in hopes of finding fruitful land. How that strategy is formed is often a difficult question to answer. Research by Pop and Borza, (2013) helps to determine how strategy works within small and medium organizations (SME). This helps further solidify the concept that strategy is based upon the environment and resources available that help to make companies more competitive. In developing strategic decisions it is important for managers to interpret the signals coming from the internal and external environment appropriately. Doing so creates an opportunity to formulate strategies not only for their daily operations but also for long term corporate interests. It is this strategy that will act as a guide to regeneration and renewal that leads to corporate achievement. Successful strategies are developed, implemented and then re-evaluated. Companies that are static and unable to change are the ones that will eventually suffer economic decline. Renewing products, procedures, marketing campaigns, distribution methods, financial resources, and human capital components are just some of the overall process that should be revisited and improved on a continual basis. To help determine how strategy is evaluated, formulated and implemented at Romanian SMEs the researchers conducted a number of case studies. They utilized five companies and formulated their approaches into concepts such as the definition of strategy, implementation, development, references, evaluation, and information in the strategic process. The study helps highlight the process of strategic development as well as the thought processes that are applied. Understanding the environment and moving through a systematic evaluation of strengths and weaknesses was beneficial. The process of environmental and competitive understanding was seen as “keeping an eye on the market”. The decision makers used exact data to make their strategies but maintained a level of flexibility to mitigate risk. They adjusted their strategy when the market called for it. When companies were developing the mission and the management team’s personal values were extremely important in developing appropriate statements and policies. Missions and processes have changed overtime making strategy a fluid endeavor. There wasn’t a specific point at which the companies made changes but they did so based upon their understanding of their environment. When change was needed it was typically the manager or the executive that made the decision. They focused on changing processes in order to adjust the internal workings of the organization to the newly adopted strategies. At times these changes created a positive or negative chain reaction throughout an organization. When these changes were dysfunctional they changed the strategy or processes again. Since many new companies within their market went bankrupt the managers tried to maintain an entrepreneurial stance and use strategy to ensure they are meeting their longer term objectives. This included trying new products and services when they create an opportunity. Yet despite their interest, the new opportunities needed to fit within their strategic needs to be considered relevant. Each company used their own specific approaches to formulating a strategy. The report doesn’t go into these concepts in depth but it is possible to see some trends that include 1.) understanding environmental needs, 2.) understanding internal resources, 3.) developing the strategy, 4.) changing processes to match the strategy, 5.) being open to new opportunities within the strategy and, 6.) changing the strategy when the market changes. 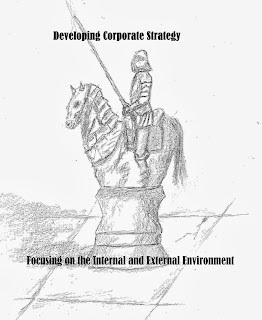 As such, strategy is a constant fluid evaluation of one’s internal and environmental factors. It is a process of seeing the trends and meeting those trends in ways that maximize financial growth and organizational sustainability. Pop, Z. & Borza, A. (2013). Summarizing the crucial steps of the strategic management process through the eyes of Romanian managers of SMES. Review of Economic Studies & Research Virgil Madgearu, 6 (1).